Please login to register as IKIS (or IKIS+Dante) member. 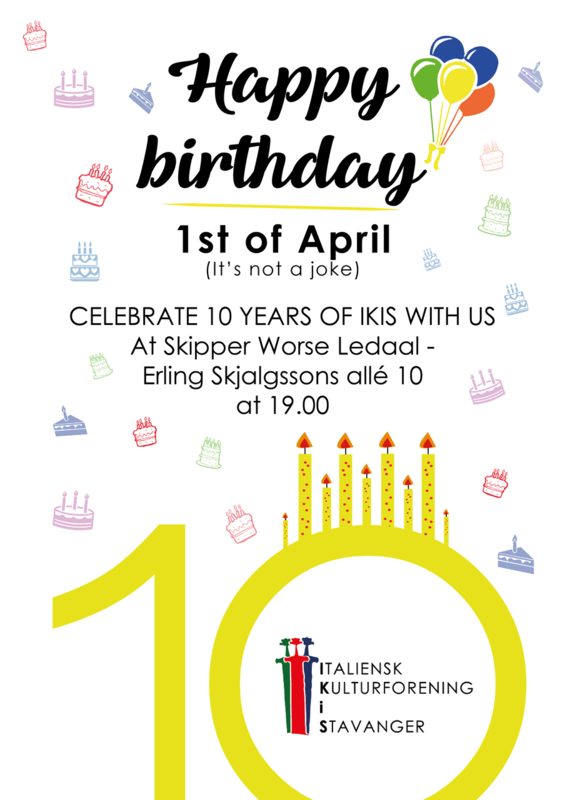 Hard to believe, but IKIS is now 10 years old!!! To celebrate, we will have a party with food, drinks and entertainment on Saturday 1st April, starting from 19.00. Gluten-free and vegetarian options will be available. We will hear some stories from Italians that have moved to Stavanger in various periods of time in the past, and will have an opportunity to exchange opinions about our experiences in this beautiful part of Norway. And of course we will have some Italian music. The party will take place at Skipper Worse Ledaal in Eiganes, the same place where we had the last Julebord. Please bring your own drinks. There will be however also the possibility to buy wine by the glass, at 50 NOK per glass. Starting with this event, you will have the possibility to pay via Vipps, also for the registration.